Remember BeOS? If you don’t that’s ok, it was an operating system that came out around 1995 and even though its performance was leaps and bounds above Mac OS System 8 and Windows 95 at the time, it never quite caught on, so it died off and seemingly disappeared. Until now, that is. 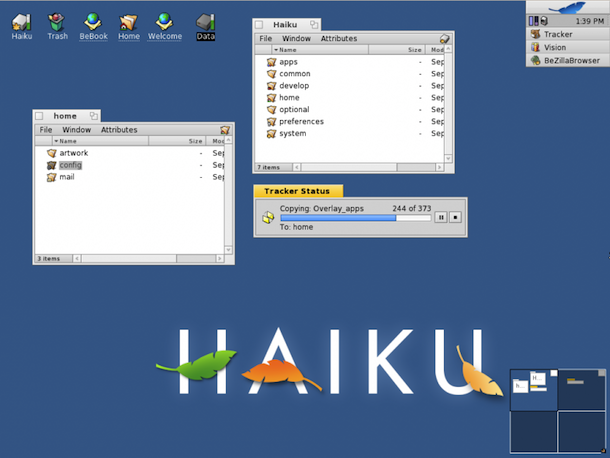 Now BeOS is reborn as Haiku, an open source lightweight operating system that you can easily run on a modern computer, whether it’s a Mac or PC. It’s certainly more of a novelty at this point, but it’s kind of fun to play around with HaikuOS / BeOS in a retro sort of way, and who knows maybe it will give Linux a run for it’s money? Well probably not, but nothing wrong with pipedreaming! 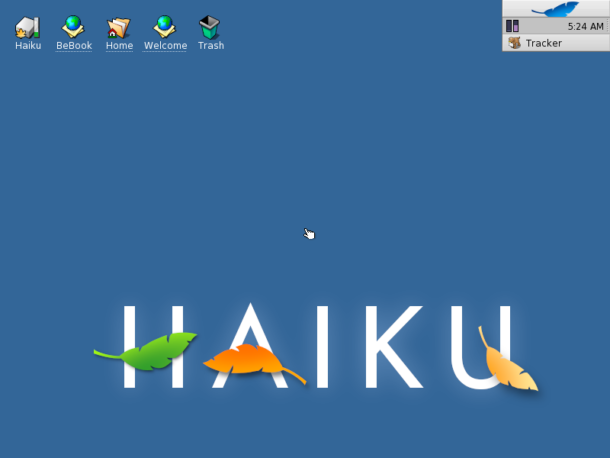 Haiku OS is free to check out and it’s definitely fun to play with, so try it out in an emulator, virtual machine, or live boot it from an ISO or disc if you’re interested. Anyway, check out Haiku, you can download it as an installable ISO, a VMWare image, or a live boot CD. If you get the ISO image you can install it yourself into VirtualBox, VMWare, and probably Parallels too. Just boot from the ISO and away you go into a live boot mode, where you can play around with BeOS / Haiku OS. Remember this is a full fledged desktop operating system, complete with a file system, web browser (called WebPositive), email client, media players, compression utilities, a Terminal, and much more, it’s obvious a ton of work went into this, and it’s still quite usable for a surprising amount of tasks and tinkering. If this cuts your mustard and you enjoy toying around with various operating systems, whether current or retro and forgotten, you might also be thrilled to explore some other virtual machine articles here. And if you run Haiku OS / BeOS and achieve something particularly interesting, or discover something noteworthy, share that experience with us in the comments below! Apple developing ad supported Operating System? I couldn’t get it to work in Parallels, but I replaced OS X with Haiku on my Dell Mini 9! Works well enough to play with, but no wireless still. I ran BeOS on my PowerMac 8500. It came with Metrowerks C++/Java compilers (later Java was dropped). Probably not a lot of Mac users remember that BeOS was the forerunner for the MacOS Classic successor… until NeXT’s Steve Jobs recommended against it and, oh, by the way, perhaps Apple should buy NeXT instead. Good that fans resurrected this OS. I remember I had like 300mhz celeron box at the time and the big news about it was that it was able to play like 9 movies simultaneously while Windows98 was dieing on 2. I gave a shot for the old beos around 2007 but by then the hw support was so bad you couldn’t do much with it anymore. I’m just about to dl the haiku vmware image and try it. It was a big mistake from BeOS-es authors not to release it as open source in 95. That was the reason why it failed.